This special back-up feature is an adaptation of Mirage’s TMNT (Vol. 1) #1 but with LEGO minifigure versions of the characters. 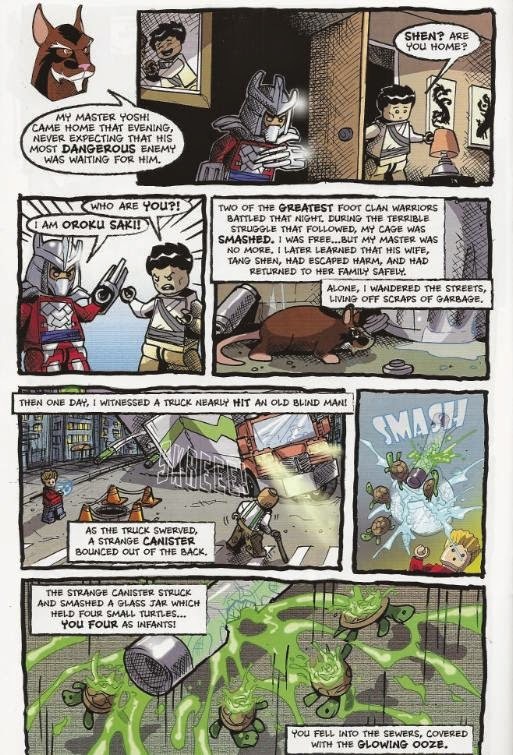 Adapts pages 1-3 of TMNT #1. Adapts pages 4-23 of TMNT #1. Adapts pages 24-40 of TMNT #1. *Being a cross-promotion with the LEGO Teenage Mutant Ninja Turtles sets based on the Nickelodeon cartoon, the Turtles are hybrids between their Mirage and Nick looks. For instance, they all have their multi-colored bandanas but lack the physical differences from the cartoon (Mikey’s freckles, Raph’s chipped plastron… although Don still has his tooth gap). The Shredder and Splinter, though, are 100% their Nickelodeon versions. *Several pages are condensed for this adaptation for matters of space. 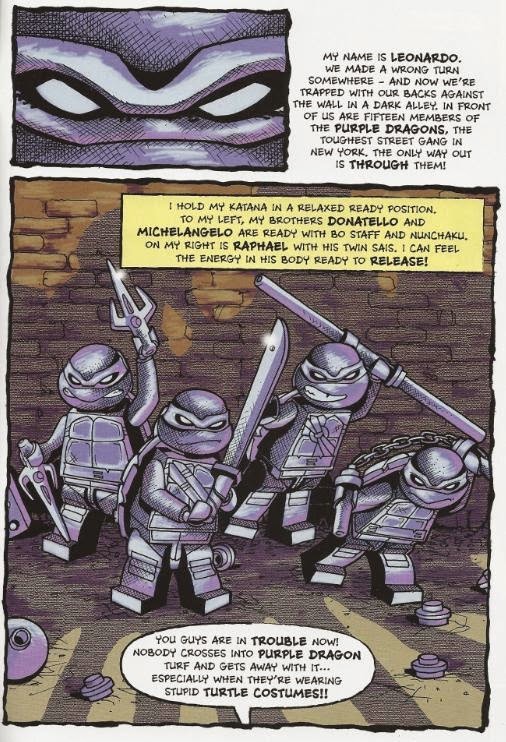 While effort is made to recreate the panels as they appeared in TMNT #1, the layouts are often changed to accommodate the condensed retelling. 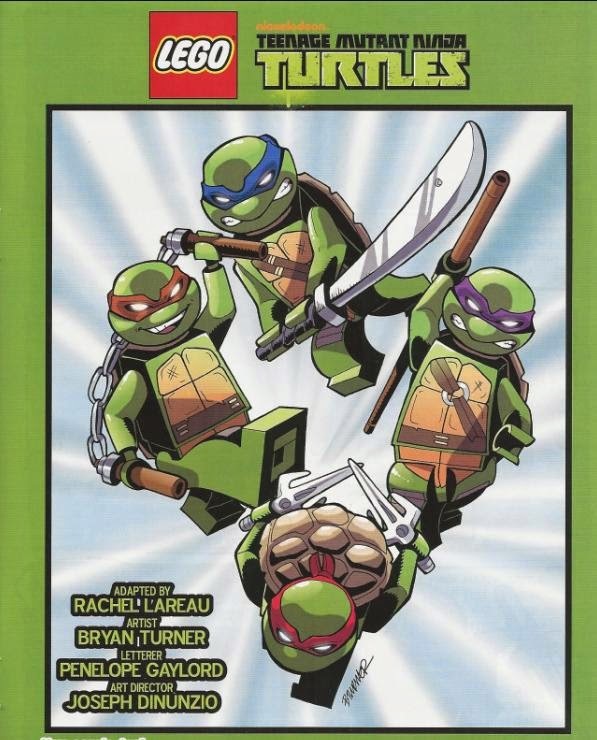 The original TMNT #1 was 40 pages, LEGO TMNT is 22 pages. **When Oroku Nagi confronts Tang Shen, it is to “declare” his love “to” her, not “demand” love “from” her. Hamato Yoshi and Nagi fight and Nagi “disappears” rather than dies. It is the act of fighting another member of the Foot Clan that results in Yoshi’s exile to America. **When the Shredder attacks Yoshi, he DOES kill him, though Yoshi is simply referred to as being “no more”. Tang Shen, though, is said by Splinter to have escaped the Shredder and returned home to her family. **Splinter charges the Turtles with challenging the Shredder, but nothing about killing him of course. Likewise, Splinter makes no mention of being on death’s door, himself. **No surprise here, but when the Turtles beat Shredder, they don’t offer him the chance to commit seppuku. Also, when Don knocks him off the roof with the thermite grenade, the explosion precedes the Shredder, thus saving him from being blown up. 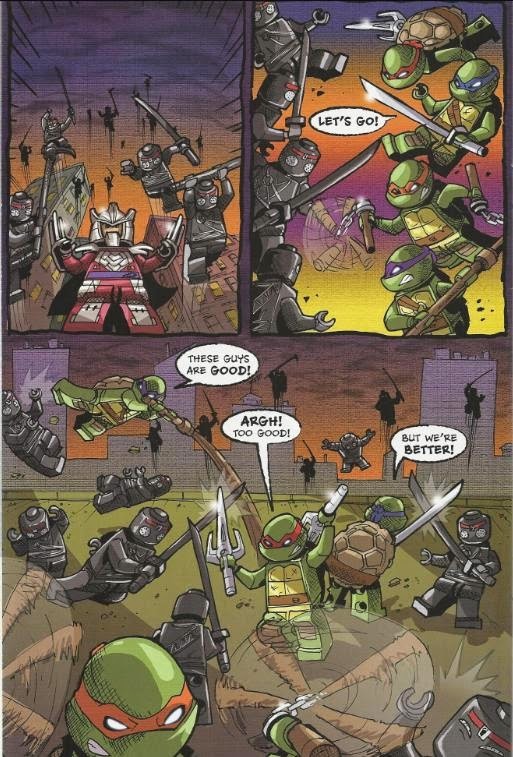 After the fight, the Turtles specifically point out that he’s “gone”. *All 3 parts of this story were collected into a single one-shot issue and sold at the 2014 San Diego Comic Con (July 9-12, 2014). This edition featured 2 new covers by Bryan Turner. For what this was, it was a pretty neat little bonus to include throughout three months of TMNT New Animated Adventures. I’ve no problem with the source material being censored for this sort of thing; it’s a goofy adaptation for a children’s comic and it’s not like we haven’t gotten the origin sanitized for past adaptations. If anyone is “offended” by the choice to excise the violence and death for a LEGO adaptation of the Ninja Turtles’ first appearance, I think they’re taking the exercise way too seriously. Rachel Lareau adapts the script well enough, making the needed changes here and there. She tries to make it more “fun” in places, giving the Turtles the occasional moment of bonus dialogue, usually something humorous or chatty. The Turtles barely speak in the original Mirage TMNT #1, so I can see why she’d want to give them a little dialogue in this adaptation for kids. She does arbitrarily change some inoffensive narration and I don’t quite get why; just a change for change’s sake. But it’s no biggy. Bryan Turner has some fun with the art and tries his best to recreate the panels using LEGO minifigures. Minifigures aren’t the most articulated toys on the planet, but he does his best. It can be pretty funny to see him trying to recreate the dynamic poses of the original art with the blocky, jointless, awkward scraps of plastic. I do wish the pages and panels hadn’t been condensed so we could have gotten a complete 1:1 adaptation. I know they had to remove the violent content, though this is a recreation, so Turner probably could have substituted those panels with something less gory (and he did in several other instances). Then again, there may have been length restrictions from IDW, so it might not have been possible, regardless. LEGO TMNT was a fun, unexpected bonus and I was happy we got it. IDW has been taking an anthology approach to New Animated Adventures in the past few months, featuring multiple stories per issue. I hope to see more of these weird, random back-up bonuses in the future; it gives New Animated Adventures a stronger identity than just “the cartoon tie-in book”. That's news to me (the TMNT stories and the fact that LEGO has a magazine). I'll put them on the list of minutia I'll need to hunt down one day. Thanks! I'm still floored by the fact that Tang Shen (and presumably, Oroku Nagi) survive. Kids adaptation or not, it's unprecedented.